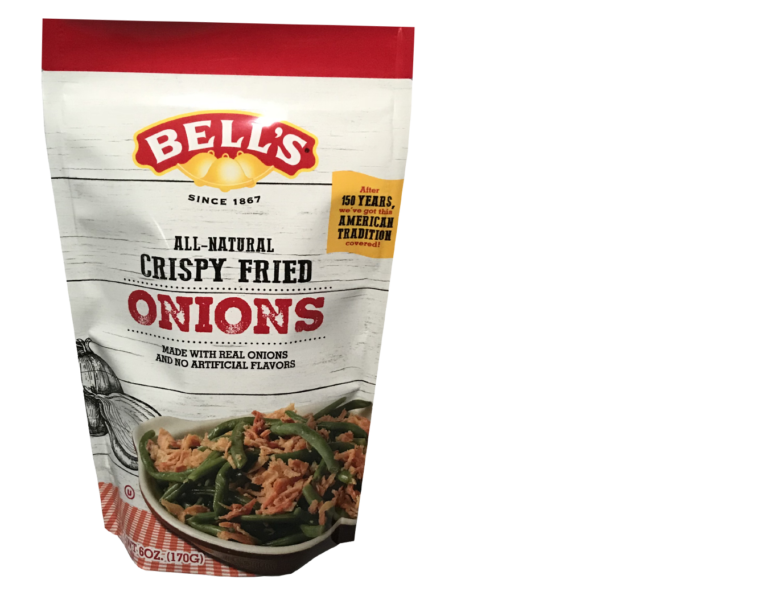 Elevate this nostalgic dish with the tasty crunch of Bell's All-Natural Crispy Fried Onions and the rich flavor of bacon and mushrooms. This green bean casserole is a delicious way to eat your greens! Cook bacon in a large skillet on medium-high heat until crispy. Add onions to skillet and cook until translucent, then add garlic and mushrooms and cook until mushrooms are soft. Boil green beans in chicken broth for 10 minutes and drain. Place in large bowl. Add bacon mixture, mushroom soup, Bell's Crispy Fried Onions, and Bell's Seasoning to bowl and mix well. Pour into casserole dish and bake for 20 - 25 minutes. Add rest of crispy onions on top of casserole, return to oven and bake additional 10 minutes.